Red River Blog Jam: Happy 4th! We wish The Shreveport Times website was easier to navigate. There's a really cool photo gallery of The American Flag but no way to link to it directly. Go here and scroll down until you see Community Galleries. Scroll down that and click on The American Flag. 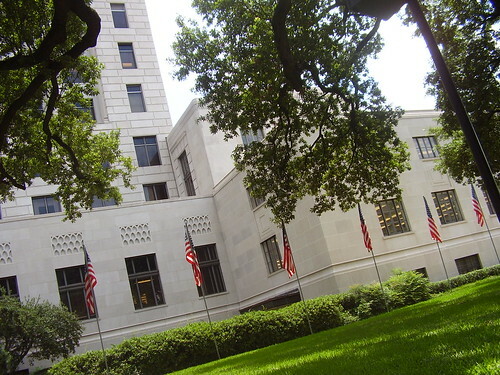 In case you can't find it we give you this cool shot of the flags on temporary display at the Caddo Parish Courthouse. Thank you to Katee Fontane for the use of her shot of the flags around the courthouse. Taken on the Texas Street side. If you right-click on the first page of the gallery and then click View Page Info, you should be able to copy and paste the address to create a hyperlink. And thanks for the kudos.